Royce Brownlie netted a second half hat-trick to guide Moreton Bay United to a 4-1 come-from-behind win over Palm Beach SC at Wolter Park on Saturday. Kristian Rees gave Sharks a single goal lead at the break before Brownlie’s haul was complemented by substitute Joseph Champness to extend Jets’ undefeated run to nine matches in all competitions. The visitors started the match strongly but were unable to make the most of promising early possession. Jets missed an early opportunity as Jackson Hall saw his strike bounce back off the post on the quarter hour. 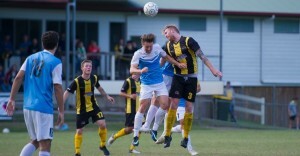 However, Sharks delivered the opening goal midway through the half as veteran defender Rees headed home from a corner for his first goal of 2015. Jets pushed for an equaliser in response as Jordan Farina forced a solid save from Shane Viitakangas one-on-one with the Sharks goalkeeper before later heading over the cross-bar with the final play of the half. The hosts started the second stanza brightly and levelled terms on the hour when Brownlie was felled in the box and subsequently converted with the spot kick. Sharks retaliated immediately as Justyn McKay struck the post with a long-range drive before Jets goalkeeper Luke Borean blocked an effort from Josh Riis. Jets took the lead for the first time with ten minutes remaining as Brownlie headed home for his second of the afternoon from Ryota Nakaooka’s free-kick. Only minutes later, Champness scored his second goal in two matches off the bench with a well-placed strike into the top corner from the edge of the penalty area after being teed up by Matthew Zappone. Brownlie then sealed the points - and his hat-trick - with his second penalty of the afternoon after Champness was more brought down in the penalty area. The result continues defending Premiers Palm Beach’s erratic form in 2015 and is their fourth loss from their opening eight matches. Speaking post-match, Jets coach Adam Piddick said Brownlie’s first goals since March were a result of his work-rate off the ball. “He actually led by example in that second half and he got the ball rolling by shutting centre backs down and not letting them play out and he got his just reward for that,” he said. Sharks coach Grae Piddick lamented his team’s errors in conceding despite acknowledging his side were fatigued following their epic mid-week Westfield FFA Cup win on penalties over Broadbeach United. “I told the boys I’ve been making a few excuses with (them) being young and inconsistent, but if you’re consistently doing that then it’s a problem and it’s something you got to fix,” he said.